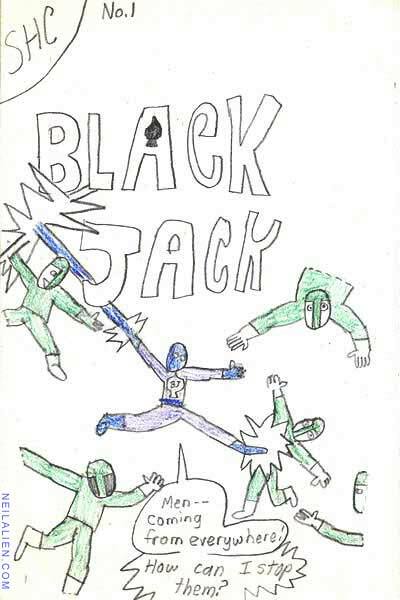 I made this comic book when I was about 9 years old. Pencil, and colored with crayon. SHC stands for Super Hero Comics, one of my many comic book imprints from childhood. DC-Bullet-inspired name/circle logo in corner. Another big earlier imprint of mine was ETR, which stood for Easy To Read. 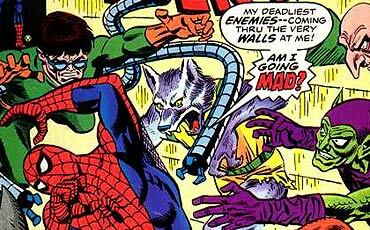 What Black Jack says, the dual speech balloon with the second balloon not round/more explosive containing the question, even the double hyphen- and the villians appearing out of nowhere through the walls: this cover was definitely inspired by the cover of Amazing Spider-Man #170 (July 1977).